In 2000, the World Health Organization (WHO) had eight sets of conflicting recommendations for decontaminating medical equipment. We conducted a systematic review of observational studies to assist WHO in reconciling the various guidelines. This paper summarises the methods developed and illustrates the results for three procedures – alcohol, bleach and povidone iodine. We developed a Medline search strategy and applied inclusion criteria specifying the decontamination procedures of interest and an outcome of microbial destruction for a set of marker organisms. We developed protocols to assess the quality of studies and categorised them according to the reliability of the methods used. Through an iterative process we identified best practice for the decontamination methods and key additional factors required to ensure their effectiveness. We identified 88 published papers for inclusion, describing 135 separate studies of decontamination. For disinfection with alcohol, best practice was identified from 23 studies as an exposure to 70–80% ethanol or isopropanol for at least 5 minutes. Bleach was effective for sterilization at a concentration of 5000 ppm for 5 minutes and for disinfection at 1000 ppm for 10 minutes (33 studies). Povidone iodine was only partially effective for disinfection at a concentration of 1% for 15 minutes (15 studies). Our findings provide an evidence base for WHO guidelines on decontaminating medical equipment. The results support the recommended use of bleach and show that alcohol could be used more widely than current guidelines suggest, provided best practice is followed. The effectiveness of povidone iodine is uncertain. Reused and poorly sterilised equipment causes infection in developing countries. For example, unsterile injections result in 8 to 16 million new infections of Hepatitis B every year, according to one recent estimate . Preventing disease transmitted by medical equipment in developing countries is a priority for health care providers, and global policy agencies such as the World Health Organization (WHO) and the United Nations Children's Fund (UNICEF) seek the most appropriate strategies to achieve sterile injections and surgical procedures. For vaccinations, the WHO's and other agencies current strategy is to recommend auto-disable syringes for immunisation, and they aim for universal implementation of this by 2003 . However, this strategy is not yet proven, the cost is high, delivery is not assured, and how they should be disposed of is not established. Some believe providers will continue to re-use injection equipment, and this is certainly likely where provision of auto-disable syringes are not assured. In addition, auto-disable technologies do not address the need for effective decontamination of equipment used in other procedures, such as general surgery, abortion and endoscopy. Therefore, policies for decontamination of medical equipment are still required and it is important that these are grounded in good evidence that they are effective. As a rule, manufacturer's instructions for decontamination of equipment should always be followed but there may be many cases where this information is not available. The World Health Organisation reviewed their current decontamination guidelines and reported their findings in a document, which has not yet been published (N Sang,. O Kasiolo: Presentation of inconsistencies found in WHO documents. World Health Organisation (unpublished) 1997). From eight sets of different recommendations, they identified inconsistencies. For example, guidelines gave a range of different temperatures and times for steam and dry heat sterilisation; and 'bleach' was recommended in some guidelines, and not in others (N Sang,. O Kasiolo: Presentation of inconsistencies found in WHO documents. World Health Organisation (unpublished) 1997). In addition, some WHO publications recommended alcohol and povidone iodine for equipment  but these agents are not included in other published hospital guidelines ; and boiling (generally considered not to kill bacterial spores) is recommended for sterilisation of equipment [3, 5]. The evidence base for the WHO guidelines is not explicit, but this is not unusual in this field. There are many guidelines and recommendations for effective decontamination practice including reports , government documents  and field manuals , with no reference to the data on which the recommendations are based. We sought to synthesise current available evidence for the effectiveness of various procedures using explicit, pre-specified methods to help inform policies relevant to primary care settings in developing countries. As no explicit methods are recognised for this, we first developed the methods for synthesising this type of data. This paper describes the methods we used and illustrates how the synthesis works in practice, using the example of alcohol in relation to lipid viruses. We also summarise the findings from the analysis of bleach (sodium hypochlorite and similar chemicals), alcohol and povidone iodine. The full review of decontamination procedures can be downloaded from the Liverpool School of Tropical Medicine web site (Systematic Review of Medical Equipment Decontamination Practices – http://www.liv.ac.uk/lstm/download/deconrev.pdf). The Methods section is divided into three distinct sections: Inclusion Criteria, Search Strategy and Analysis. Studies were selected for inclusion in the review according to several explicit and pre-defined criteria. These criteria are described in detail here under headings of outcomes measured, types of study and the decontamination procedures under review. Following this, we describe the search strategy developed to identify all published studies that may meet these criteria. Finally, identified studies were assessed in detail to ascertain whether or not they actually met the inclusion criteria and the findings of each one summarised, compared and presented. We describe here the methods of analysis we used for this process and the criteria we used to compare studies. 'A process which removes or destroys contamination (defined as soiling or pollution with harmful, potentially infectious or other unwanted matter) and thereby prevents microorganisms or other contaminants reaching a susceptible site in sufficient quantities to initiate infection or any other harmful response. Three processes of decontamination are commonly used: sterilisation, disinfection and cleaning' . Decontamination procedures are defined by the types of microorganisms they kill or remove. Thus, a sterilising agent destroys all microbial life and a high-level disinfecting agent kills all microorganisms except large numbers of bacterial spores. Microorganisms differ in their resistance to decontamination and we used indicator microorganisms from the groups shown (Table 1) to represent the huge variety of potential contaminants. These indicators were chosen according to their particular resistance to decontamination (for example, picorna viruses) but some were also included on account of their particular medical significance in the area of equipment contamination (for example, HIV). The only decontamination outcome sought was the destruction of indicator microorganisms, demonstrated by a) negative microorganism culture in vitro, b) failure to demonstrate their viability in animal models or c) a negative result using sensitive molecular methods. It is clear that the ability to decontaminate equipment is dependant upon the initial level of contamination and we therefore needed a quantifiable benchmark against which to compare studies. The British standard protocol for testing disinfectants is the ability to show a 5log10 reduction in viable microorganisms (BS EN 1040: 1997 Chemical disinfectants and antiseptics. Basic bactericidal activity). We took this standard as a practical minimum requirement for studies to be included, considering it a reasonable level of kill while excluding as few relevant studies as possible. Observational studies with microbiological outcomes in the laboratory and field. Studies of in-use procedures, procedures experimentally applied to indicator microorganisms and applied to artificially contaminated equipment were included. Studies written in any language other than English and studies prior to 1976 (the date from which electronic abstracts are included in Medline) were excluded. Given the volume of studies retrieved from the database, we considered it impractical to include data from earlier studies and studies that would need detailed translation. We included decontamination procedures likely to be available in resource-poor settings and effective for the decontamination of 'critical' and 'semicritical' equipment (Table 2). Critical and semicritical are terms used to describe equipment's need for decontamination and are linked to the subsequent use of the equipment. Thus, equipment that is used in normally sterile areas of the body (e.g. needles that penetrate the skin) has a 'critical requirement' for decontamination and is described as critical equipment. Semicritical equipment does not penetrate skin or other tissue and the requirement for decontamination is classed as less (e.g. specula). To be effective for critical equipment, a procedure must destroy all microorganisms, but for semicritical equipment, all microorganisms except large numbers of bacterial spores should be destroyed . Procedures requiring specialised apparatus or conditions (such as irradiation, ethylene oxide, gaseous formaldehyde and peracetic acid washer/disinfectors) were not looked at. Low-level disinfectants and antiseptics (such as quaternary ammonium compounds and phenolics) were not included, as these are not effective for critical and semicritical equipment. A search strategy for Medline was developed with advice from colleagues in the Cochrane Infectious Diseases Group in Liverpool. The full search strategy is listed in Table 3. We used database-defined subject headings for decontamination procedures and indicator microorganisms. The terms used for procedures were 'sterilization' and 'disinfectants'. We combined the exploded versions of these terms (incorporating all terms listed as sub-headings) with specific procedure sub-headings such as 'alcohols'. Some areas of disinfectant use were not related to medical equipment and these were excluded from the search using the exploded headings 'histocytological preparation techniques', 'handwashing' and 'sanitary engineering'. The terms used for indicator microorganisms were those listed for each microorganism group. These were also exploded to include not only the relevant microorganisms but also any surrogates that may have been used experimentally. Text words for particular organism genera or diseases (e.g. Herpes) were also included in the search where relevant. We obtained and assessed the full text of all relevant papers from the search. A table of excluded studies and the reasons for exclusions are in the full report. The most common reason for exclusion was that the number of microorganisms exposed to decontamination was not measured, meaning no comparative analysis was possible. However, where the outcomes of these studies provide useful information about the procedures, we refer to them. 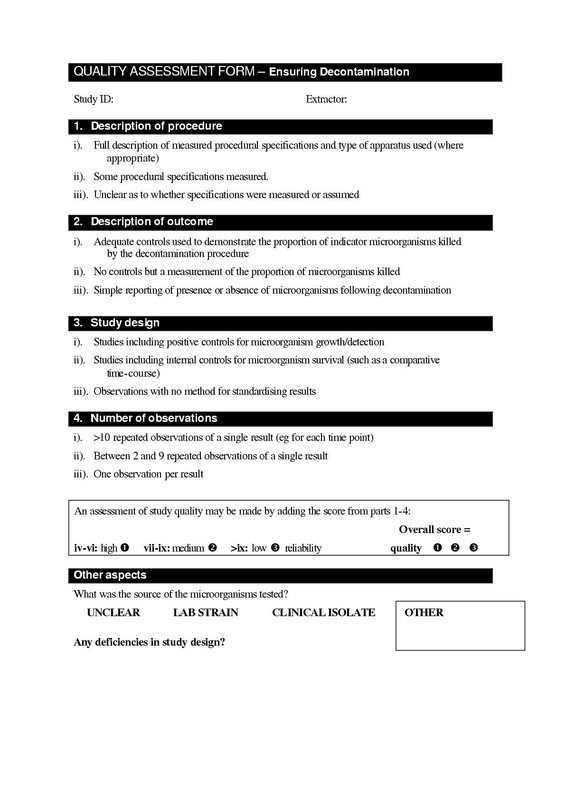 The quality of included studies was assessed using criteria of a) quality of the procedure description, b) quality of the outcome description, c) quality of the study design and d) the number of observations for each recorded result. The form used is shown in Figure 1. Scores (out of a possible three) were given for each of these criteria and the total used to assign comparative reliability grades for each study. These grades were not definitive but allowed the comparison of studies within this review. Form used to assess the relative quality of studies identified by the systematic review search strategy. For each section (Arabic numerals), three options are given((i)-(iii)). The one that best describes the study being analysed is chosen and allocated as a score. At the bottom of the form, these scores are added (maximum possible score = 12) and the relative reliability of the study scored accordingly as high, medium or low. The form also allowed the noting of any other relevant information about the study described, such as the source of the micro-organism looked at. b) the method of outcome assessment (for example, was it measured by culture or molecular means?). c) the study design (for example, did the study include controls?). d) Analysis of organic load (for example, was organic load present or its effect tested?). An example of the analysis of extracted data is shown in Figure 2. The results were grouped within procedures by the organism tested for, separating procedures between critical and semi critical equipment. Thus, studies using bacterial spores or CJD as indicator microorganisms were grouped as evidence for critical equipment. Studies using any other microorganisms were grouped as evidence for semicritical equipment. Each procedure was treated separately and so where one publication tested a range of procedures in the same experiment, each test was counted as a separate study. An example of the method by which results were presented in the review, showing the effectiveness of alcohol to kill lipid viruses. An overview of the relevant studies included in the review is given and a standard operating procedure iterated from these studies is described. The iterative process is then illustrated by classifying the studies as containing evidence for or against the standard procedure (Table A). Included in this assessment are possible reasons for disagreement between the studies shown ('Possible sources of heterogeneity'). One study in this group did not contain sufficient detail to classify it in these terms and the outcome is listed separately (Table B). The summary table of the evidence includes the standard procedure and comments about the strength of the evidence as well as factors that are identified in the studies as being essential for the desired procedure outcome (critical points). The studies identified used a wide range of different procedural specifications such as time of exposure to agent. To synthesise this information in a sensible way, we built up a representative set of specifications that were described as effective to destroy the particular indicator microorganisms. The specifications required to kill the most resistant microorganism were not always representative of the majority of studies. Therefore, the specifications effective for the majority of studies were chosen and each study classed as evidence for or against this standard. This process allowed flexibility to iteratively develop the standard specifications according to the findings of subsequent studies. Once we had classed each study, we summarised in an adjacent column the possible reasons for disagreement between studies showing a procedure was effective, and those showing it was not effective ("possible causes of heterogeneity" in Table A, shown in Figure 2). In this way, major factors influencing procedure efficacy became clearer and these often coincided with the critical points described above. Some included studies showed results that could not be described in these terms of 'evidence for' or 'evidence against' (for instance, during a time course of exposure to disinfectant, the period of measurement may stop short of the standard time specification iterated). These studies nevertheless contained valuable evidence or results that could be reasonably extrapolated and they are described and referred to when the effectiveness of a procedure is not clear from other studies. For each procedure and level of decontamination, minimum conditions for effective decontamination were presented. These conditions are a product of the iterated standard specifications and any secondary outcomes that were shown to have a critical impact on the effectiveness of the procedure (critical points). An assessment of the evidence and the reviewer's conclusions were also presented. Out of 3396 records that were retrieved using the search protocol in the Medline database (from 1976-April 2000), 88 published papers met the inclusion criteria for the review. Within these papers there were 135 studies of the effectiveness of the chosen procedures against the indicator microorganisms (Table 4). The full results can be downloaded from the Liverpool School of Tropical Medicine website http://www.liv.ac.uk/lstm/download/deconrev.pdf. We present here summaries of the results for alcohol, bleach, and povidone iodine. The effectiveness of alcohols was assessed in 23 of the included studies. None of these studies assessed alcohol's effectiveness for critical equipment. For semicritical equipment, the standard procedure derived from the included studies was exposure to 70–80% ethanol or isopropanol for 5 minutes. Alcohols were particularly effective for lipid viruses (such as HIV) [9–11] and bacteria [12–14] but non-lipid viruses (such as hepatitis A) and mycobacteria may be more resistant, especially when dried to equipment[15, 16]. There was not enough evidence to give a more definite assessment. The presence of organic load did not impair effective decontamination with alcohol except in cases where contaminating material (such as dried serum) limited its access to microorganisms. Results for alcohols applied to lipid viruses are shown in Figure 2, to illustrate the application of the review methods described. The effectiveness of bleach was assessed in 37 of the included studies; 10 effective for critical equipment and 27 for semicritical equipment. Comparison of these studies was made difficult by the different nomenclature used for 'bleach'. As described, our definition of bleach includes sodium hypochlorite and similar chemicals. Bleach activity is regularly described in terms of concentration of available chlorine (% or mg per litre), parts per million (ppm) and ppm available chlorine. The most consistent terminology in the included studies was ppm available chlorine (used in 57% of papers identified) and the results are presented in these terms (for ppm, read ppm available chlorine). Where concentrations of available chlorine are quoted as percentages or mg per litre, these were converted to ppm for consistency. A formulation of 5,000 ppm available chlorine is equivalent to a 0.5% solution (of available chlorine). For critical equipment, a standard procedure of 5000 ppm sodium hypochlorite bleach for 5 minutes (pH = 7–8) was sufficient to kill bacterial spores. For semicritical equipment, the standard procedure of 1000 ppm for 10 minutes was found to be sufficient. From the critical points described, effective decontamination is compromised by the presence of various organic matter [17–19], a very large number of microorganisms  and situations where microorganisms are dried to equipment . Mycobacteria and viruses are particularly resistant to the standard procedure for semicritical equipment when they are dried to a surface. These factors highlight the necessity of cleaning equipment before using hypochlorite and this is also a critical point that is described . In addition, it should be remembered that bleach can be corrosive to metal equipment and this may be an important consideration for its use. The effectiveness of povidone iodine was assessed in 15 of the included studies. As with alcohol, none of these studies assessed its effectiveness for critical equipment. For semicritical equipment, the standard procedure of a concentration giving 1% available iodine for 15 minutes was found to be sufficient. Bacteria and mycobacteria were particularly susceptible to this procedure but viruses may be more resistant [22, 23]. There were not enough studies using viruses to determine a definite effectiveness or non-effectiveness for povidone iodine. Decontamination guidelines often give no reference to the source of their recommendations  and very rarely justify or qualify any evidence that is cited . The evidence is difficult to assess, therefore, where inconsistencies occur between guidelines (N Sang,. O Kasiolo: Presentation of inconsistencies found in WHO documents. World Health Organisation (unpublished) 1997). The review described is an attempt to systematically gather the relevant evidence for effective decontamination and reproducibly assess it so that decisions may be made as to the most relevant procedure to use. We have developed methods to assess and analyse observational data where there is little standardisation in outcome measurement between studies. The novel means by which we have analysed the quality of this data has allowed the comparison of studies that lack the consistency and robustness of randomised controlled trials. The protocol we have used is also flexible enough to allow the review to be updated as more studies become available, much like a Cochrane Review. This approach may have applications in other areas of guideline appraisal and could be developed to provide a solid evidence base for other practices that may have been adopted. This report summarises evidence systematically gathered for bleach, alcohol and povidone iodine. There is good evidence for the effectiveness of bleach as a decontaminating agent for both critical and semicritical equipment and the standard procedural specifications derived using our methods support WHO guidelines. Similarly, the findings for alcohol also agree with WHO publications, though it is not recommended to the same extent as bleach. 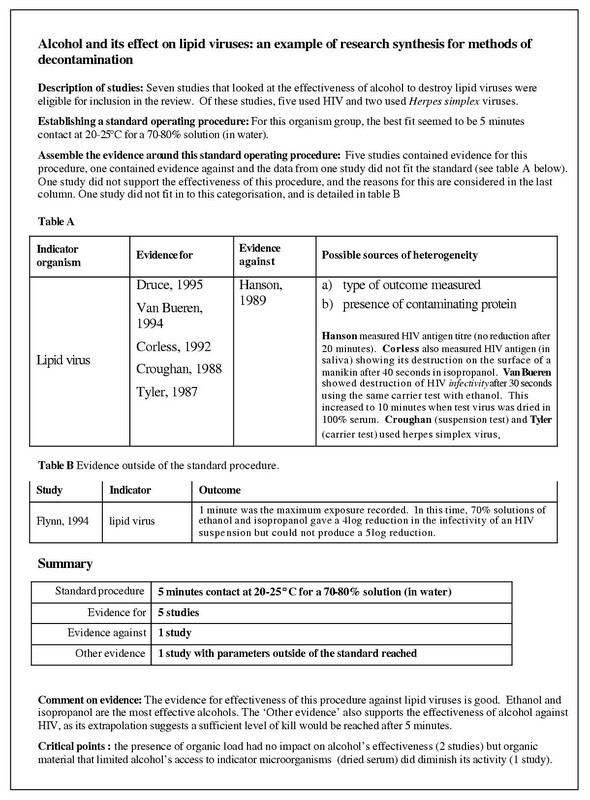 The exclusion of povidone iodine from the majority of decontamination guidelines (N Sang,. O Kasiolo: Presentation of inconsistencies found in WHO documents. World Health Organisation (unpublished) 1997) is supported by the evidence here, since the iodophor has uncertain activity against viruses. In order to manage the data and provide a valid analysis, certain stated bias was included. The first bias was using a cut-off time for inclusion of studies. As already described, 1966 to the present day is the limit of electronic databases and we limited this further to only include studies post-1976. This was mainly for practical reasons, to keep the volume of studies manageable and also to limit chasing irrelevant studies whose titles sound full of promise but for which no abstract is provided (abstracts are not included for pre-1976 records in Medline). The introduction of language bias was also for practical reasons. Many studies in languages other than English were potentially eligible for inclusion but they would have required very detailed translation in order to assess the precise de contamination methods used. Despite these limits, we consider that the number of studies retrieved were sufficient to develop representative specifications. One of the main areas for exclusion of relevant studies was their quantification or description of indicator microorganism destruction. In order to compare the potency of decontamination procedures between studies, we set the ability to show at least a 5log reduction in microorganisms as an inclusion limit. In reality, effective decontamination is achieved when there is no infection passed on and this will be influenced by the infective dose of the contaminating microorganism and the susceptibility of the host, as well as the initial level of contamination. These factors will be different for every situation and so decontamination, as such, cannot be quantified in a laboratory. Setting a minimum level of demonstrable destruction allows the comparison of data from diverse studies and is simply a tool to aid the analysis of data in this review. Setting such a limit obviously excluded studies that were otherwise relevant and, it could be argued, introduced misleading bias. Where there was heterogeneity in the evidence for a particular microorganism/procedure combination, however, these excluded studies were checked for data that may influence the outcome. In every case, such data did not challenge the standard specifications iterated from the included studies, suggesting this was a valid and useful cut-off point to incorporate. The explicit methods used to search for studies and assess them for inclusion enable this review to be updated. The methods we have used to analyse the procedural specification data also allow updating of the results by further iteration. By grouping evidence as for and against the standard set, reasons for disagreement between new studies and the standards developed in this review should be immediately apparent. Though the levels of evidence for each procedure were mixed, the results of this review agree with current decontamination guidelines, often reached by consensus and not systematically. This approach, therefore, provides a means by which observational and non-standardised data can be systematically summarised to give formal evidence for guidelines. The implications of the results for the WHO are to standardise decontamination guidelines across the various arms of the organisation. These methods of systematic review and analysis may enable evidence-based guidelines to be made in similar areas where data cannot be pooled or assessed using standard methods. The standard procedures iterated for bleach differed from the WHO guidelines that included this agent (N Sang,. O Kasiolo: Presentation of inconsistencies found in WHO documents. World Health Organisation (unpublished) 1997) but did not contradict them. Guidelines only gave a recommendation for critical equipment and this was neat bleach (generally 52,000 ppm) for 30 seconds or 5000 ppm bleach for 10 minutes. Procedures for alcohol and povidone iodine are not described in the guidelines reviewed (N Sang,. O Kasiolo: Presentation of inconsistencies found in WHO documents. World Health Organisation (unpublished) 1997) but are mentioned elsewhere in WHO publications. The procedures derived here show some scope for their use as disinfectants but there is not enough available evidence to demonstrate their effectiveness against all the indicator microorganisms. In recommending alcohol, one WHO publication describes it as not effective against non-lipid viruses and this is supported by the evidence here. The same publication recommends iodophors as effective for both non-lipid viruses and bacterial spores but the evidence for povidone iodine here disputes this. There are several considerations to be made when choosing a particular means of decontamination and this review focuses only on the microbiological effectiveness of agents. Other factors include cost and the compatability of decontamination agents with particular pieces of equipment. Manufacturer's guidelines for decontamination should always be followed where possible as these will take into account risks of equipment corrosion through inappropriate decontamination. The factors that impacted the effectiveness of procedures most frequently in the review were the presence of organic material and the drying of microorganisms to a surface before decontamination. These factors may either neutralise the potency of the decontamination agent being used or protect the target microorganisms from exposure to the agent. Thus, the critical point common to the majority of the procedures was the need to clean equipment before decontamination, and this is specifically mentioned or quantified in many of the studies. This demonstrates that, for the procedures described here, the application of a decontamination procedure is as important as the choice of procedure. A panel of specialists helped at the protocol and review stage by providing important technical advice and suggestions. We are very grateful for their input. They were: Barbara Stilwell (WHO), John Lloyd (PATH), Mary Catlin (PATH), Anthony Battersby (FBA systems), Craig Mackintosh (Clatterbridge Hospital). The panel are not responsible for the content, and the data presented and the views expressed are entirely those of the authors. This research was supported by the Department for International Development (UK) through their support to the Effective Health Care Alliance Programme based at the Liverpool School of Tropical Medicine. WS wrote the protocols, identified the studies, conducted the data extraction, and synthesised the data. PG identified the topic and advised on methods development, data extraction, interpretation and writing of the paper. TH helped identify the relevant questions, outcomes and indicators and advised on the literature search. All authors contributed to revisions and finalising of the paper and the report.